It was the family reunion of 2012. I had a ton of family coming into town and a bunch of them were staying at my house. I have a big finished basement with a few bedrooms down there so I have plenty of space to host people over at my home. I truly enjoy seeing all of the family together too. Its not often that we get to share this time with one another. The only pickle I find myself in is what do I make to eat for breakfast. I usually wind up the crock pot and cook a big delicious breakfast overnight in there. But I also wanted to make a few other things just so that I could have more variety. You know that everyone has different taste buds so it’s always better to prepare for someone to want something else. One of the delicious things that I made for breakfast was this awesome cinnabon cake. Oh my goodness did this taste amazing. I made it two mornings in a row and both mornings I had no leftovers. Everyone gobbles that cake up like it was running out of style. 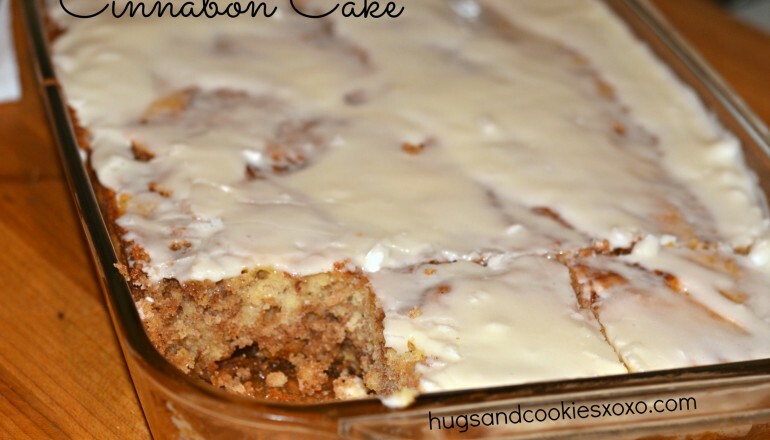 This is definitely a cinnabon cake that I will be making for just myself and my husband! He loved it too but hardly got any! Recipe and photo credit courtesy of The Novice Chef Blog. Quick Tip: Sprinkle some cinnamon over the top.